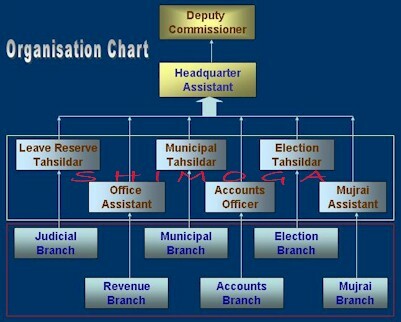 As is clear from the organizational structure chart, Deputy Commissioner is head of the district administration. The collectorate consists of various branches headed by Shirastedars or Managers who are responsible for supervision, guidance and overall management of work in their branch. Every branch consists of First Division Assistants and Second Division Assistants among whom all work of the branch is divided. There are various officials both at the district level and at the taluk levels to assist the Deputy Commissioner. They include the Assistant Commissioner’s (Sub-Divisional Magistrate), Tahsildars, Shirstedars, Revenue Inspectors and Village Accountants. The Deputy Commissioner Court deals with cases pertaining to Revenue Appeals, Revenue Miscellaneous ( KLR Act, 1964 ), Prohibition of transfer of Certain Lands cases ( PTCL Act,1978 ) and inam cases( Inam Abolition Act ). One SDA&nbsp; and Manager of Judicial Branch assist the D.C by doing backoffice work. 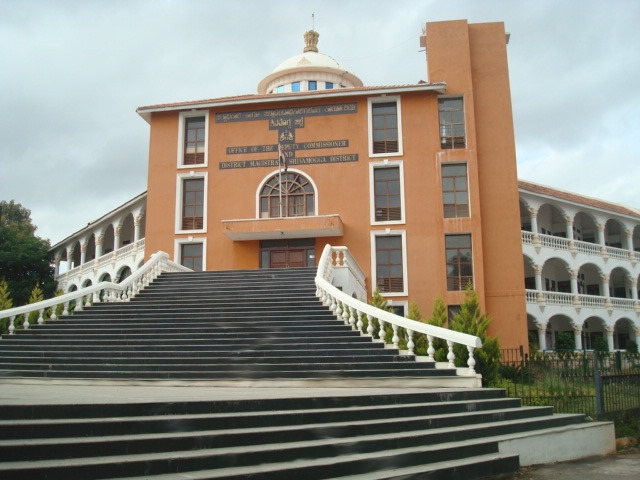 The office of Deputy Commissioner and District Magistrate is located in the heart of Shivamogga City near Gandhi Park. The office is just a furlong distance away from the Railway station. The office is a three storey building with various offices located inside the building. People come to the district level office with variety of grievances and most of the time people don’t know whom to contact and how often need to contact to get his/her work done. Here is a bit of useful information .. Administrative Section : Which deals with the matters relating to vacancies, appointments, pay & allowances, transfers & promotions, postings, retirements, CCA (Classification, Control & Appeals), Personal Deposit Accounts, Audit Reports, DC Diary and Business Statistics. Revenue Section : This section deals with jamabandi, DCB (Demand Collection & Balance), Land Grants, Land Acquisition, Land Conversion, PTCL, Appeals, Land Reforms cases, Mines & Minerals and Regularisation of encroachments. Election Section : This section deals with Election matters pertaining to Loksabha, Vidhansabha, Vidhanparishat, all local body elections such as Grama Panchayat, Taluk Panchayat, Zilla Panchayat, Municipalities, APMC, and other co-operative institutions. 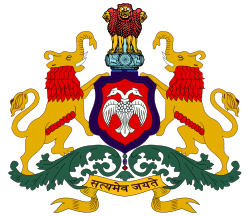 Municipal Section : This section deals with all Municipal matters including service matters, progress made under various schemes like SJSRY (Swarna Jananthi Shahari Rozgar Yojana), IDSMT (Integrated Development of Small & Medium towns), Water supply schemes, Housing schemes and Slum Area Development. Mujarai Section : This section deals with construction & renovation of Muzarai temples, appointment of Dharmadarshies and payments to Archaks’ (Tasdik & annuity) salary, Aradhana Schemes. Census : This section deals with census matters. Judicial Section : This section deals with judicial matters such as Law & Order (Section 144 etc.,) issue of licenses for Arms and Ammunitions & Cinemas. Miscellaneous Section : This section deals with NSAP, OAP, PHP, MPLAD and other Schemes. It also deals with meeting statistics, PWD works, issue of income and caste certificates, House Rent Control (HRC) and other miscellaneous matters of Revenue Department.